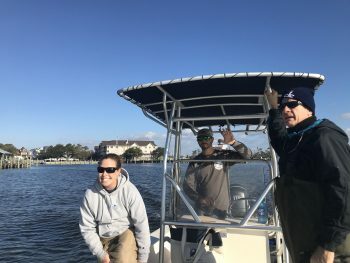 Working on both water and land, northeast staff and volunteers were excited to participate in the Town of Manteo’s biannual cleanup on Nov. 17. 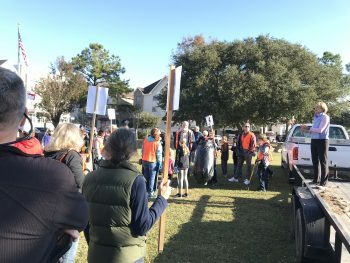 Over 80 volunteers came out to help make Manteo shine including Boy Scouts, Girl Scouts, Manteo Rotarians, Mount Olivet Youth Group, Roanoke Island Garden Club and some of the Master Gardeners from Elizabethan Gardens. Trash was collected by teams of volunteers that collected debris throughout the town’s streets before it could infiltrate local waterways. Plastic water bottles, beverage cans and cigarette butts were the most commonly found items, but a heating element from a microwave took the prize for most interesting find. 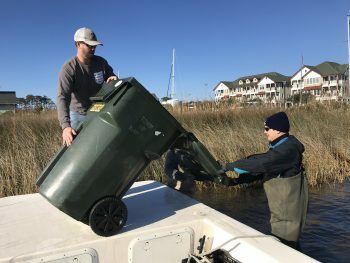 A volunteer team from the federation hit the marshes of Manteo on boat to remove some unique debris. Various sports were represented in the team’s findings which included a basketball, baseball and tennis ball. 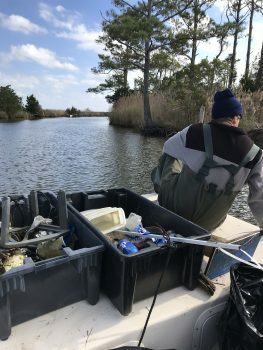 A brand new dog toy, a pair of pants, a backpack and brand new plastic totes were also tucked away in the marshes along with many beverage cans and bottles. However, a vintage vacuum cleaner and a town trash can were the most exciting finds for the team. It’s possible that much of this odd debris made it to the marshes via flooding from the hurricanes that affected the town in September and October. 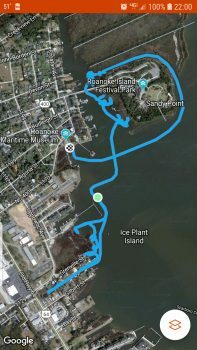 In conjunction with the litter pickup, the Town of Manteo planted 10 round stone pots and three stone troughs with a variety of native plants. 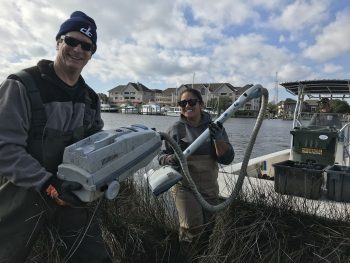 To learn more about the federation’s work with marine debris and how you can help, visit nccoast.org/marinedebris.